If you own a mid-range to top-end fitness tracker or smartwatch, it’s likely that you can upload your workout data to running and cycling social network Strava. Strava has become one of the biggest names in the fitness recording and sharing space, but the company currently has no plans to create a device of its own for those who contribute to the uploading of 11 million workouts every week. “We often ask the question,” said James Quarles, CEO of Strava. “I think the pace of innovation within our partners continues so rapidly that our best strategy from an engineering standpoint is to try to integrate with those devices. Strava currently supports 300 devices and Quarles believes that has worked to the company's advantage “because hardware is a very tough business“. “I used to be in the hardware business,“ he continues. “The development cycles and staying on top of technology is hard. “What we want to do – and what we think is more valuable – is to allow all people to share, no matter what their device, whether you’re an Apple fan or an Android fan, Garmin fan or Fitbit fan. Integration is clearly much more important to Strava, and that’s partly how the app has become a household name when it comes to sharing your fitness data. Many of those 300 devices Quarles mentions are mobile phones, but there are a wide range of fitness devices too. In fact, you’d be hard pressed to find another fitness app that’s available on such a broad range of devices. Whether you have any version of the Apple Watch, a Samsung Gear Sport or even a Fitbit Charge 2, you can upload your data to Strava and share your workout with friends and family. It’s not just about sharing with Strava though, it’s also about motivating yourself by competing against your peers, whether you’re friends on Strava or not. Strava began as a cycling app and community in 2009, and soon expanded into running, walking, hiking and other sports. Now you can use the app to track and share your swim, ice skate, rock climb or even your snowboarding adventure. You may think the app has everything covered, but Quarles has big ideas for other activities it will hopefully one day be able to track. There are a variety of '7-minute abs' workouts, but usually these are HIIT (high intensity interval training) sessions where you'll be given lots of quick tasks to do over a period of around seven minutes. Quarles specifically mentioned the idea of ‘7-minute abs’, but it looks like Strava wants to cover a wide range of indoor workouts, rather than just being the app that can track your outdoor activities. Speaking of the future and the evolution of tailored home workouts, Quarles continued: “It's less device-centric, and it's more experiences that are being purpose-built for people's activities. Looking to the future, Quarles says Strava wants to be “the home of people's active lives, which encompasses everything that you do. It’s not just to ingest and aggregate all that data, but we also want to make sense of it. This has been a common theme throughout our Fitness Week interviews, with top experts at the likes of Nokia and Polar also saying the future of fitness tech is improving the way data is used within health eco-systems to make it easier for the user. Working with that data to tell the user to take two days' rest is clearly a puzzle Strava would like to one day be able to solve, but there are a lot of competitors already trying to do the same thing. Matched Runs is a feature within Strava that allows you to run the same route multiple times, with the app providing you with trends so you can see areas for improvement, and congratulate yourself where you’ve consistently done well. And we can expect to see more of those features within the Strava ecosystem in the future, as new technologies are introduced and we can gain more insight into stats while working out. Quarles himself may head a company whose app is used by millions every week and which encourages its users to record all the data they can, but it’s not always how he wants to be monitoring his own fitness. Talking about his own fitness setup, Quarles said: “I’m very much in favor for the technology not getting in the way of the experience. A lot of my activity is outdoors, but even indoors it’s important to be present and not distracted by it. “The first thing is tech that’s passive, meaning it’s recording and sensing things that are important but isn’t interrupting my range of motion or my view of the experience of other people. “I think that the things I would like to track are related to heart. In the bike world there’s power, and as it moves into running we’re seeing that as a trend in 2018. I think the score and sense of strength is keen. “For me it’s probably a wrist-worn device that’s doing those things and something to get light notifications on when I’m doing better or worse to give prompts that are out of the way. “You would not find me to be someone to find enhancement on a set of glasses and AR. 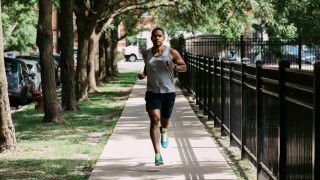 While Quarles has definite ideas about the kind of fitness tech he wants to wear, and what it should be monitoring, for now at least he’s happy to leave the hardware side of things to others. So don’t hold out for a wearable made by Strava any time soon.